At the beginning of 2019, The Concepts of Ravnica launched at Lodestone Coffee and Games. 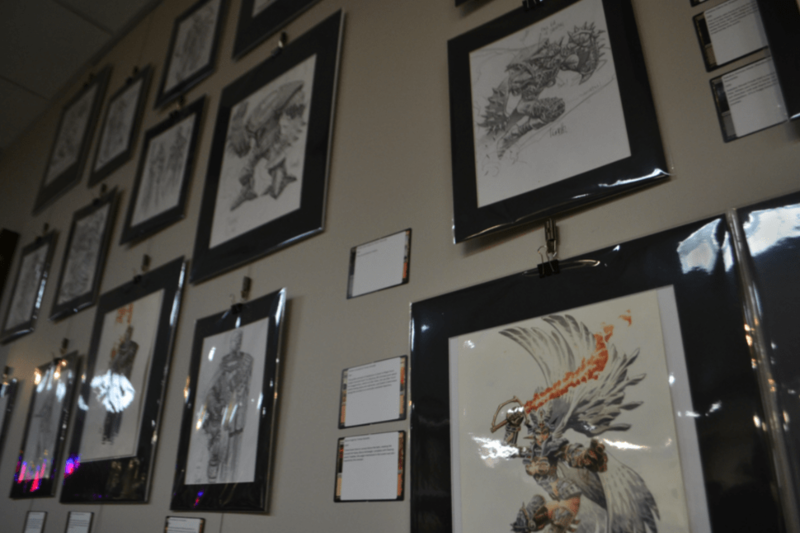 This show, on display until March 1, showcases original Ravnica concept art for Magic: The Gathering. It will display a total of 75 pieces by Tomas Giorello and Wayne Reynolds over the course of its run, rotating three guilds at a time. The show is a product of the work and generosity of Magic art curator Mike Linnemann, otherwise known as Vorthos Mike. He used his personal collection of art, which he bought with the intention of showcasing it to the public, to assemble The Concepts of Ravnica. Linnemann, who has also organized popup shows in Tokyo and Las Vegas, describes the show as an experimental, because it’s not hosted by a formal gallery space or museum. Instead of barriers and museum doors, the concept of this show “is to bring the art itself to the people,” Linneman says, and it was because of wanting this accessibility for the show that he chose Lodestone Coffee and Games as the venue. The shop is close to where Linnemann lives, he is part of that community, and it was the best option given other logistics of planning an art show, like insuring the art. At Lodestone, the show lines a single wall of the store and hangs within arm’s reach of gamers playing at the nearby tables. Nothing separates gamers from the art except for thin plastic casings, which resemble card sleeves. According to Linnemann, Magic: The Gathering attracts a lot of “mechanically minded people” who aren’t necessarily thinking about the art on the cards. This isn’t to say the community doesn’t care about the art—it is just that the art often serves as a shortcut for the what the card means. For example, a Magic player might think more about the powers of their card and memorize the image associated with it but without paying close attention to the details of the art. “When we bring the art show to the players, they are then confronted with it,” says Linnemann. People who wouldn’t otherwise go to a popup galley get to see the pieces. It is no longer a matter of just looking at a card, memorizing it for play, and then ignoring the art. The art is there on the wall as they play. Another way the show engages the Magic community is by giving the opportunity for lapsed players—those who don’t regularly play, perhaps because they now have kids and don’t have the time anymore—to connect with the game in a new way. Seeing or buying concept art is a way to express their connection to the community and game although they no longer play often. Even for active players, cards often get filed away after a new set comes out, and concept art is also a way to remind players about older sets. Linnemann says he considers a show successful when players make the connection between concept art and the cards. The show exists for moments like those when players look at the art, recognizing it, and then grab their phone to look up more information on the pieces or bring in the related card. Concept art also made sense for a show like this one, because showcasing it is logistically easier than other options. Concept art is much cheaper than paintings and can be showcased in a shop. It is the only way to get art right in front of the players. All these aspects made Lodestone Coffee and Books a safe testing grounds to try a show like this with no barriers. The Concepts of Ravnica is one event that looks to build the cultural relevance of art from games like Magic: The Gathering. It’s not just about developing a connection to art within the Magic community—it’s about recognizing the cultural relevance of that art and other game-related art throughout the Twin Cities. The hope is that, after enough shows like this one, more museums will start recognizing the cultural relevance of concept art for games, building their collections of that art, and hosting shows. In addition, as shows with gaming art are organized, more artists, too, might realize that producing art for games can be a viable way to make a living and build a career. 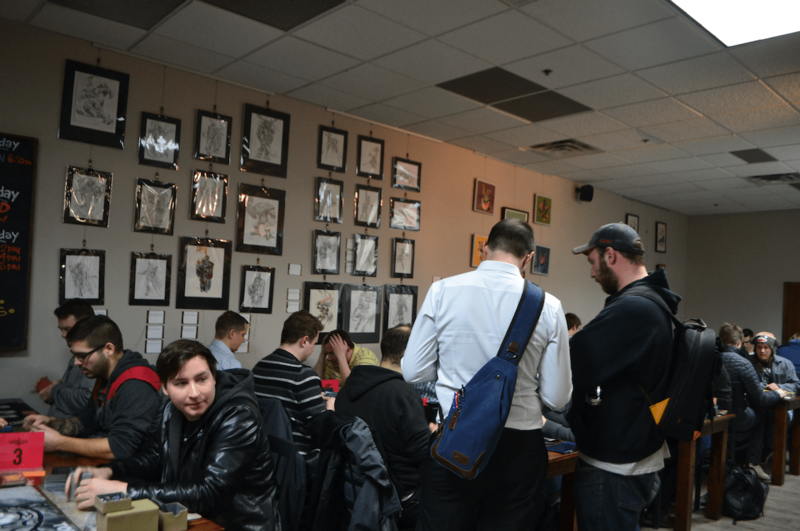 The Concepts of Ravnica runs now until Friday, March 1, at Lodestone Coffee and Games in Minnetonka, Minnesota.